Our customer is the hub of our activities and all our services revolve around the customer as a nucleus. This emphasis has led to constant innovation in the services that we provide which in turn have enhanced our performance standards. We are constantly in the process of adding a host of services to our existing portfolio so we can serve you better across the entire spectrum of you logistic requirements. Through our network of international agents and carriers . One call service tailored to each customer's needs. With highly trained cargo professionals in our international network, each one knows the culture, provides fluency in their language and is thoroughly familiar with local regulations concerning the importation and exportation of products and goods. We offer comprehensive overseas shipping and relocation services that reduce the time, cost, and stress associated with moving and shipping your goods. 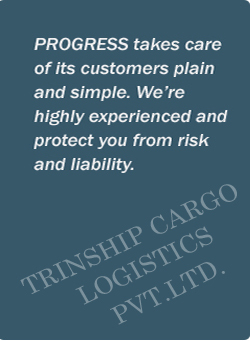 To Provide Multimodal transport solutions to corporate with experience, professionalism and cordiality.